Ghanaian popular dance is a contemporary dance genre that explores the aesthetic elements in the free style or street dances generated with hiplife music, mainly as a form of self-expression. Examples of Ghanaian and other African popular dances will be discussed, such as Azonto and Akayda (Ghana), Shorkie and Shaku Shaku (Nigeria), Gweta (Togo), Gwaragwara (South Africa), and more. Students in this workshop will warm up with traditional Ghanaian games to create a sense of community, break inhibitions, and enhance enthusiasm. 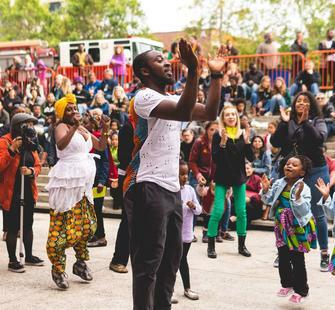 Next, instructor Philip Agyapong will explain what Ghanaian or African Popular dance is, its influence on community, its music, names of several dance styles, and why they are created and for what purposes. He will then give a dance demonstration, which will be broken down into its simplest form for students to rehearse. After practicing the whole choreography, students will be put into smaller groups to perform for each other.